“Everyone in the transportation industry knows the pain of RFPs,” Golob explained. “The challenge of compiling data from across your company, late nights, pizza deliveries and unforgiving deadlines.” At TMSA, we couldn’t agree more. "We’ve heard from members how important RFPs are in the buyer's journey - and it was one topic of discussion at the recent TMSA Digital Transformation Conference last October in Chicago. No doubt, our members are looking to get more value from their CRMs and winning more RFPs is top of mind, too. Yet, some talk about getting pushback from their CFOs who are always looking for a proven, reliable business case before investing in software. 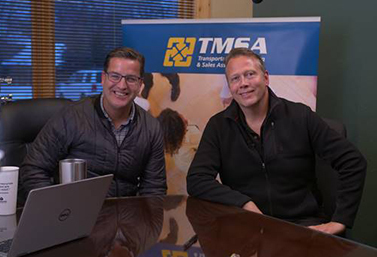 John Golob, CMO of Winmore, and Brian Everett, CEO of TMSA, recently met to discuss features of the transportation industry’s first RFP and bid management application. To learn more about the Winmore RFP and Bid Management software, log onto www.winmore.app. Winmore is a TMSA Affiliate member, and sponsor/exhibitor at the 2019 TMSA Logistics Marketing & Sales Conference June 9-12 near Jacksonville, Florida. Comments on "Product Alert: Transportation's First RFP and Bid Management Application "